We are always pleased to see our cheeses being used on local restaurant and pub menus – either as an ingredient or as part of a British or Sussex cheese board. One place we’re particularly proud to have an association with is the restaurant at nearby Gravetye Manor, where a focus on seasonal local produce has helped win it a Michelin Star. But in January the tables were turned when, instead of cheese being taken the seven short miles from the High Weald Dairy to the kitchen at Gravetye, the kitchen came to visit the cheese! The restaurant at Gravetye is currently closed (until May 2018) for an extensive remodelling which has given the chefs a chance to go out and visit some of their local suppliers to learn more about the produce they use. We were happy to be among the places selected and hosted a team of 16 chefs, led by Head Chef George Blogg, on a half-day visit. Head Cheese Maker Chris Heyes showed the chefs around the Dairy and took them through the process of making Brighton Blue. 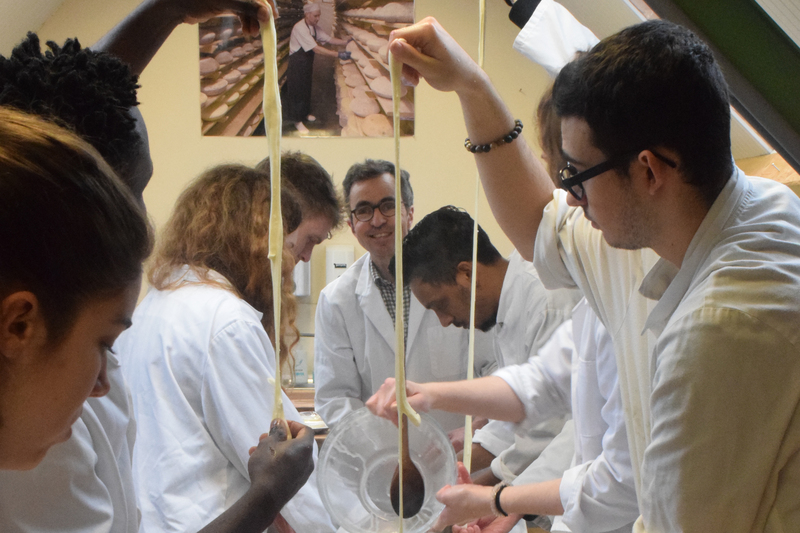 The chefs were then welcomed to our Sussex cheese school to make mozzarella with Mark before a tasting of six of our cheeses. Head Chef George said: “It was an incredible experience. To be able to go around and see, from start to finish, the process of making Brighton Blue was fantastic. It’s such a great blue cheese. 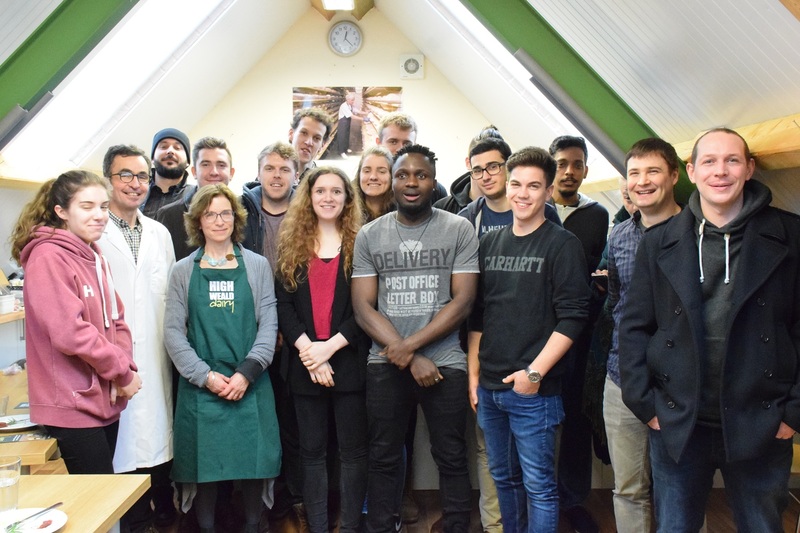 George said the whole experience has given all the chefs a better understanding of the cheese we produce and has also fuelled their imaginations and given new ideas which may start appearing on the menus when the restaurant re-opens in May. In fact, shortly after the visit George was championing Sussex cheese alongside produce from Gravetye’s own impressive kitchen garden at the gastronomic event – Obsession. This international festival of food sees a different chef take over the kitchen at the Northcote Hotel in Lancashire every night for 18 nights in a showcase of talent from around the world. The chefs are challenged to create a unique menu for their night and we were thrilled to learn that George used cow’s curd from the High Weald Dairy in his first course which centres around celeriac grown at Gravetye. If you would like to try some of George and his team’s inventive menus you can make reservations on Gravetye Manor’s website where you will also find more information about the new restaurant they are building. 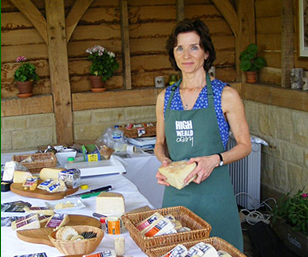 Look out for High Weald Dairy cheeses on the menu. They are often used as an ingredient in recipes like George’s lunch menu starter of Heritage Garden Beetroot Salad with High Weald Dairy Cow’s Curd, which he has been kind enough to share with us. Our St Giles and Brighton Blue cheeses are also fairly firm fixtures on the local Sussex cheese selection or their Best of British selection. 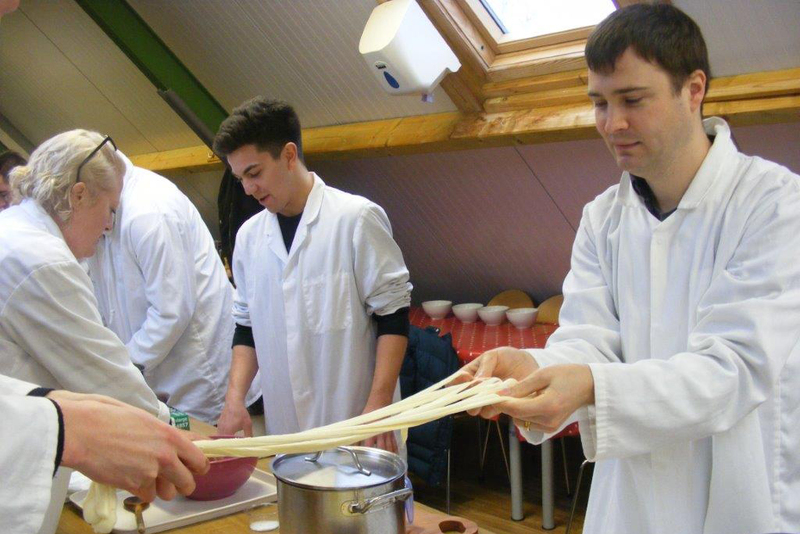 If you like the sound of the chefs’ experience at High Weald Dairy, why not book yourself a place on our one-day cheese-making course at our Sussex cheese school where you will get the chance to tour the dairy and will have the chance to learn how to make cheese at home?